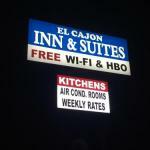 El Cajon Inn & Suites offers accommodation in El Cajon 30 minutes' drive from SeaWorld San Diego University of California San Diego and downtown San Diego. Each air-conditioned room at this motel is equipped with a TV. Select units have a seating area for your convenience. Every room comes with a private bathroom equipped with a bath or shower. The nearest airport is San Diego International Airport 26 km from El Cajon Inn & Suites.The San Diego Wild Animal Park is 48 km away.